(see picture below) Note the buckets on the roof. That might be MJ and Ernest on roof to water it down. Year is estimated as 1917. The store was saved. M. J. Fingerson went broke in Terril, Iowa, and returned his family to to South Dakota. (We see MJ and his family in the 1919 4th of July picture.) My mother, Della (Fingerson) Gageby, says that her dad, MJ went broke because he gave customers goods on credit and was not repaid. (Mom was 5 when MJ died) Mom says that Knute Fingerson family members gave her dad tools and animals so that he could start farming when they returned to South Dakota from Iowa. "I'll always remember Terril, Iowa, not only because my three sisters and I were born there but because we have so many wonderful memories of that town. It is also the town where our dad's general merchandise store was located. Dad sold everything in that establishment, clothing and dress goods, tools to tobacco, and soap to soda pop. He had three clerks helping him and during the Christmas Season even had some part-time help. The store was always decorated for special holidays and at Christmas time the decorations were the talk of the town. My oldest brother, Ernie, although only a teenager, used to help out somtimes on Saturdays and after school. Ernie remembered the time when several Indians came in the store to purchase supplies. The braves sat around on the floor while the Chief pointed out the things he wanted, to my dad. Ernie recalled being awed and a little afraid. Then there were the times when the gypsies came to town. When the kids in Terril saw the caravan of wagons, they ran home real fast as there was a rumor around that the gypsies kidnapped children and they were never seen again. Some of the gypsies came in the store. A few of them would keep the clerks busy while the others would swipe merchandise and hide it in their clothes. But my dad was onto them and they didn't get away with much. I was quite small but I remember the wonderful smell of the pickle barrel. Another great scent I recall was the empty cigar box where the soda pop bottle lids were tossed. The strawberry and grape scent mixed with the aroma of cigars was a great smell. Alas! 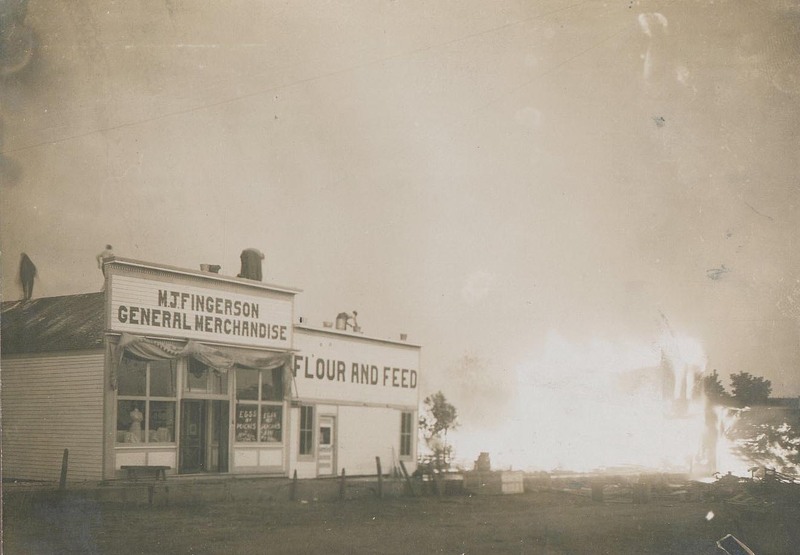 The M. J. Fingerson General Store, for reasons unknown to me, was closed out in early 1918, and we moved to Arnolds Park. I have many fond memories of that area also."